Major fossil fuel producers bear a particular responsibility for climate change. Their products cause a buildup of heat-trapping gases in the atmosphere. Many of these companies have worked to systematically block laws or regulations that would reduce heat-trapping emissions, in some cases by spreading disinformation about climate science. And they are continuing to encourage, plan for, and invest in expanded and unabated fossil fuel use—despite fully understanding the adverse climate impacts of their products. It’s time for fossil fuel companies to be held accountable for their climate actions. Climate impacts are intensifying around the world and fossil fuel companies must be held accountable for their climate actions. Companies should immediately stop funding climate deception and publicly acknowledge the long-term goal of the Paris Climate Agreement and its implications for a swift transition to global net-zero emissions. This comprehensive study includes eight leading fossil fuel companies and is based on extensive research into the companies’ climate-related communications, positions, and actions, focusing on the period from January 2015 through May 2016. Results for ArchCoal and Peabody Energy can be found in the full report. The analysis provides a detailed look at four main areas where these companies must take immediate action to prevent the worst effects of global climate change. Each of these areas includes multiple metrics that contribute to a company’s overall score for that area; the full analysis features a total of 30 metrics. The scorecard is intended to help accelerate the transition to a low-carbon future by equipping the media, investors, policy makers, and consumers—you!—with tools to assess companies’ current performance and urge specific, immediate action. The methodology and supporting appendices for the analysis are available below. Company affiliations with trade associations and industry groups. Click to enlarge. 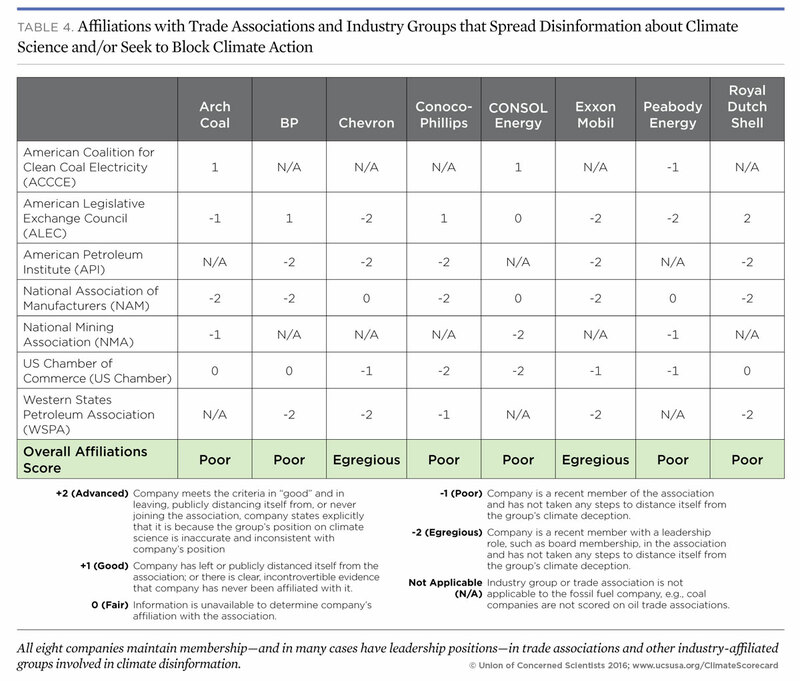 All eight companies maintain membership—and in many cases have leadership positions—in trade associations and other industry groups that spread disinformation about climate science and/or seek to block climate action. Among the companies in our study, only BP and Shell have publicly expressed support for the international climate agreement reached in Paris in 2015 and its global temperature goals. None of the eight companies has laid out a company-wide pathway or plan to align its business model with the Paris Climate Agreement. History was made with the Paris Climate Agreement in 2015, when countries worldwide committed to an ambitious plan to reduce carbon emissions in order to curb climate change. However, major fossil fuel companies currently have business plans that would result in emissions far greater than the limits set in Paris. It’s time for these companies to align their business models with the global temperature goals outlined in the Paris Agreement. BP and ConocoPhillips received a score of “good” in this area, primarily due to the companies’ disclosure, policies, and oversight related to political spending. All companies should do more to publicly support and advocate for climate policies. During the study period some of the companies made general statements about the need to reduce emissions of heat-trapping gases but fell short of expressing support for specific US policies, such as the Environmental Protection Agency’s (EPA) Clean Power Plan or the EPA methane rule. Only ConocoPhillips and ExxonMobil have acknowledged climate change as a contributor to the physical risks faced by their businesses. All of the companies studied can and should do better to fulfill existing climate risk disclosure requirements, and they should begin to prepare for enhanced disclosure regimes in the future. The Union of Concerned Scientists has developed a set of standards for fossil fuel producers that choose to chart a new course and act responsibly on climate change. Renounce disinformation. Stop all corporate support for disinformation on climate science and policy, including affiliation with or funding of organizations involved in spreading disinformation. Plan for a world free from carbon pollution. Align the company’s business model with a carbon-constrained world consistent with the goal of keeping warming well below a 2°C increase above pre-industrial levels, as agreed by world leaders. Support fair and effective climate policies. Consistently and actively advocate fair and effective policies to reduce heat-trapping emissions at the subnational, national, and international levels. Fully disclose climate risks. Fully disclose financial and physical risks of climate change to the company’s business, including its infrastructure and reserve assets. Pay their share of climate costs. Agree to pay the company’s share of the costs of climate-related damages and climate change adaptation. This report does not assess company performance in this area, as no fossil fuel company has even begun to pay its share of the costs of climate damages and adaptation. We’ve reached peak bottled water. From today, for a sweet £80, Harrods will sell ‘luxury water’ harvested from icebergs off the coast of Svalbard. Svalbarði is the brainchild of Jamal Qureshi, a Norwegian-American Wall Street businessman who visited the archipelago in 2013, and returned with melted iceberg water as a gift for his wife. He then, it seems, decided to bring this water to more people. And this is not the only problem. First, sea ice is already melting. The extent of Arctic sea ice shrank to its second lowest record last year and scientists have warned this could have devastating impacts across the rest of the world, such as shifts in snow distribution that warm the ocean and change climate patterns as far as Asia, as well as the collapse of key Arctic fisheries, which could impact other ocean ecosystems. Icebergs don’t need yet more human interference – no matter how small the scale – to speed up the melting process. The bottled water industry is already giving us enough of a headache. It is estimated that 3l of water are need to produce just one 1l plastic bottle of water, which is more likely to be discarded and end up in landfill than recycled. Beside the fact that our planet is slowly silting up with plastic, it also takes huge amounts of fossil fuels to make water bottles – plastic or glass – and transport them around the world. In the US, for example, 1.5 million barrels of oil are needed per year to meet the demand of the country’s water bottle manufacturing. For so many of the things we buy, there is a flashier, pricier, more luxurious alternative for those who can afford it. Why travel in economy if you could travel first class? Why buy from the high-street when you could buy designer clothing ? Water, it seems, is just the next in a list to receive this divisive treatment; why, if you live somewhere it is clean and safe, drink water from a tap when you could drink bottled water from “pristine peaks”, “artesian aquifers” and now “from the top of the world”?The wheels are in motion. Precedents have been set. Will more wealthy entrepreneurs now eye up other precious natural resources to create yet another “must-have” item?We already live beyond our means. Our lifestyle choices see us using the equivalent of 1.6 Earths to provide the resources we consume, and absorb what we throw away. At such a time, Svalbarði seems insensitive, ignorant and irresponsible. It’s time to live sustainably and consume responsibly, not promote mindless habits just because some people can afford it.For some time, water has been thought of as a commodity, and even the former UN special rapporteur on the human rights to safe drinking water and sanitation believes it doesn’t have to be free. But something so precious, so essential to all life – human, animal and mineral – should never be marketed as a luxury. Things are heating up in the Arctic, yet again, this week, as one storm has already caused temperatures near the North Pole to spike by nearly 30C on Wednesday, and even more heat is on the way in the days to come as they will be approaching the freezing mark. That may not seem like anything remarkable, but right now, in early February, in the deep darkness of the Arctic winter, 0C is roughly 30C above normal for what thermometers should be reading for that part of the world.